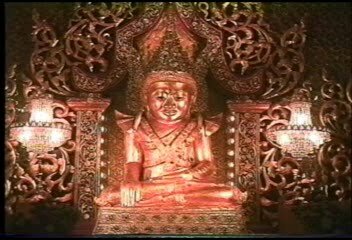 The great outstanding feature in the history of Arakan is the account of Buddha’s sojourn in this country and of his supervision over the casting of his image. The story of his seven day’s visit with five hundred Rahandas— his lengthly discourse pregnant with prophesy delivered on the top of the hill opposite the town of Kyauktaw– His Journey into the city of Dynnyawaddi at the request of King Sanda Thurya— the casting of the image by men and gods, have been very clearly set fourth by the able researches of the late Dr. Forchammer and need hardly be mentioned again in the present sketch. The Mahamuni tradition is the oldest of the kind we have. It permeates the whole religious history of Arakan and the images that at present sanctify a thousand temples and pagodas in this country are the replicas of the first great and only faithful copy of the Master. to have happened. Besides this Burmese books especially bear unmistakable signs of being treated, that is to say, they often take up an important event, enlarge upon it, and then relate how it was prophesied_ generally by Buddha_many centuries before. In spite of these adverse peculiarities of the East I entirely agree with the learned Doctor that the Mahamuni Tradition is not an after-thought. It is genuinely old and was implicitly believed in by successive generations that came after it. Kings of Arakan, even after they had shifted their capitals to various other places, always recognised it as a sacred duty to visit it from time to time and generally made it the occasion for great religious feasts of charity. In such cases they invariably left some votive offering, may be a small shrine or an image, as a memento of their distinguished visit. On the other hand it is not my purpose here to try and reconcile this great discrepancy in time as I am convinced of the utter futility of the task. 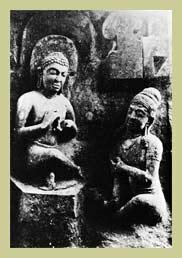 The very fact that neither Buddha nor any of his five hundred Rahandas who accompanied him into Arakan ever made mention of this unique event in the many subsequent discourses delivered in India is sufficient to tempt one to lay down the pen so far as this point is concerned. My scheme in the present work is simply to trace the history of this famous image from the time of its installation on a small hill close to the ancient city of Dannyawaddi till it was finally carried away to Mandalay by Bodawpaya of Burma . So this is really a continuation of the story begun by Forchammer but in which I propose dealing with principal events only. After the sacred image was finished and suitably installed it was allowed to remain undisturbed for a period of over nine centuries. During that time it became the religious centre of the kingdom and all its neighboring states. Its fame spread far and wide and it so worked on the envy of the Burmans that much of the early wars between these two people were actuated by the sole desire on the part of Burmese kings to remove the image into their country. In 1078 A.D.Min Bhi-lu of Arakan was killed by a noble who usurped the throne. Min Re-baya the heir apparent fled with his family and took shelter at the court of Kyan-sittha of Pagan. The fugitive prince remained in exile for twenty five years during which time a son was born to Min Re-baya and is known in history as Let-yar-min-nan. It is true that Kyan-sittha promised to restore the royal fugitive to the Arakanese throne but the lack of suitable opportunity prevented that monarch from redeeming his promise. On the death of Min-Re-baya Alaung-si-thu who had already succeeded his grandfather determined to place Let-yar-min-nan on the throne of Arakan. To carry out this object he sent 100,000 Pyus and an equal number of Talaings both by land and sea into Arakan. There was some show of stub-born resistance at first which the more disciplined troops of Burma gradually but surely overcame. Thus Let-ya-min-Nan came unto his own in 1103 A.D. and as the Pyus were instrumental in bringing this about he is also known to the Arakanese as ysLwmodef;rif; (the king created by the 100,000 Pyus). When these soldiers had accomplished their task and just on the eve of their departure for Burma they visited the shrine of Mahamuni. There they found it so richly stored with gems and gold that overcoming all religious scruples they began to despoil the temple of all its vast wealth. From the image itself the Pyus scooped out the greater portion of the back, the Talaings cut off the whole right leg and carried away these treasures into their country__ a distinct fulfillment of Gotama’s dicta. When Let-yar-min-nan came to Arakan the capital was Ping-tsa. On his astrologers advising him that the city was no longer fit for occupation because all its good fortune had departed, he found the new city of Parin. Fifty years after this Da-tha-raza ascended the throne. The new king was powerful and just and the country enjoyed general peace and prosperity. Following the example of all pious kings who went before him he decided to visit Mahamuni. His Ministers were sent in advance to make the necessary preparations for his stay there. But they return with the information that the temple could not be found. He then entrusted these men with his personal jewel instructed them to give away as reward to any person or persons who could direct them to sacred spot. After much trouble and by the assistance of two Mros they found the place__ the men being rewarded as ordered by the king. When news of the discovery reached the royal ears he immediately set out for the place with his entire court. The image was found in the ground buried up to the neck. The right leg and the greater part of the back were missing. The shrine was completely destroyed by fire. The king at once saw the exposed nature of the place. He knew that its general isolation among the hills was the too frequent cause of the shrine being desecrated by the wild tribes who made periodic visits of plunder into these parts. He therefore conveyed the image by water into the ancient city of Dinnyawaddy. The chronicles tell us that invitations were then issued to all the neighbouring kings and princes to visit Arakan and share with him the supreme merit to be acquired by undertaking the entire repairs of the most sacred image and shrine. The gathering of ruling princes was a representative one. First they repaired the image itself by supplying the missing parts. Then they erected the shrine on which were lavished all the skill, energy and resources they could command. In the building of the surrounding walls the work was proportionately divided between the different races that were present. Thus some were asked to carry out the work on the east of the shrine, some to the south and so on. The temple and the walls were decorated with exquisite carving. The latter contained human figures representing all the races of the earth. There is no doubt about it that this second building of Mahamuni was a great historic event. What little is left of it at the present day amply proves it. The spot selected was a small hill at the north east corner of the city. The nine kutis of treasure left buried by king Sanda Thurya was also unearthed, removed and buried again at the northern end of this hill. The stone slab placed on the mouth of the pit was so immense that a thousand men, say the chronicles, would not even be sufficient to shift it from the place. The whole thing was finished in seventy-one days. Several races undertook to visit the temple once in every three months for the purpose of carrying out such minor repairs as were considered necessary from time to time. But some of the tributary tribes were given definite work to perform and were required to always leave behind certain persons to guard the place. The details of the allotment of such specific duties were also recorded in stone tablets at the four cardinal points. These records no longer exits in their usual places though I am told they were there until quite recently by an authority of no mean repute. 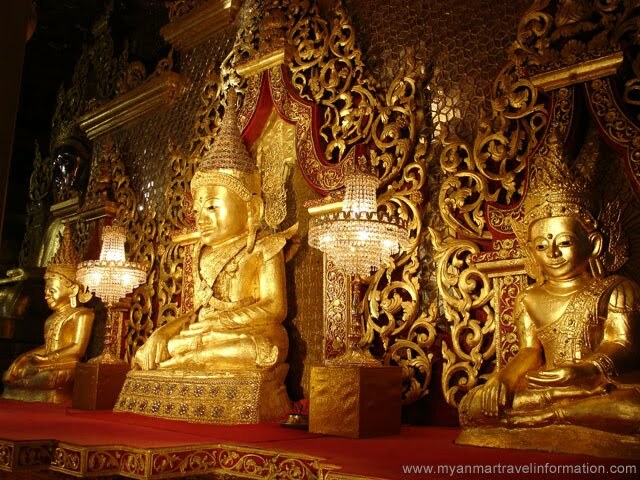 In the closing scene of its variegated history Bodawpaya of Burma comes in__ a fit character for a fit occasion. After his final conquest and so- called pacification “solitudinem faciunt pacem appellant” he directed the famous image to be conveyed into Burma. This was accomplished in the year 1785 A.D.. The excess of patriotic fervor led some people a few years ago to declare that the real image was lost in the creek close to the site in the course of its removal and that the soldiers fearing the king’s wrath took away a substitute. 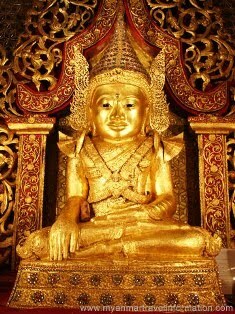 Attractive as this country proclaims the image that now adorns the Arakan pagoda at Mandalay to be the genuine one. It will be seen that the present account deals with the principal events only. But it must not be supposed that during the long interval between these epochs the image and the shrine were allowed to remain in peace. The frontier tribes such as the Chins, the Mros and the Saks periodically descended from their mountain homes and harassed the kingdom whenever it was known the ruler of the country was weak or incapable. On such occasions they always made it a point to visit the shrine and after taking away all the riches it contained they invariably set fire to it. Whenever this happened the then reigning king would fourth with rebuild it and make good the loss. In the chronicles this occurs with painful regularity. What seems to me to be rather a curious fact is that even at the time of Da-tha-raza, towards the middle of the 12th century, this well-known temple and image could not be easily found. At the present day none of us has any idea of the original site though the chronicles describe the place pretty clearly. I think there are two reasons to account for this. In the first the names of hills and creeks in familiar use in those days are no longer employed now; and the daily occupation of all our time in western education and per suits has so alienated our interests that it has become almost impossible for us to identify the old names with the present ones. Secondly the abundant rainfall so favors the rapid growth of vegetation that the few years of neglect is sufficient to entirely cover up any structure with dense jungle. But whatever the true reason may be it would be tremendously worth our while to discover this spot as there is no knowing what interesting archaeological finds we may come across.